If you are injured on the job in Massachusetts, you are supposed to be able to collect benefits more easily than if you were to file a lawsuit for damages. In exchange for giving up the right to sue employers, workers are intended to receive workers' compensation benefits regardless of fault. Unfortunately, insurers do not always handle submitted claims fairly, and it is not always a smooth process acquiring the benefits you need after a job-related injury or illness. The Division of Dispute Resolution is the part of the Department of Industrial Accidents that handles the adjudication of contested claims. The Boston workers’ compensation lawyers at Pulgini & Norton are familiar with this process and can guide you through each step. Supervised by a Senior Judge, the Division of Dispute Resolution helps insurers and workers voluntarily settle their claims, and it also provides a system to have disputed cases resolved through the work of administrative judges. The Division of Dispute Resolution has five parts. The first three, known as Conciliation, Industrial Accident Board, and Review Board, adjudicate disputed claims. The other two are Impartial Scheduling Unit and Operations. 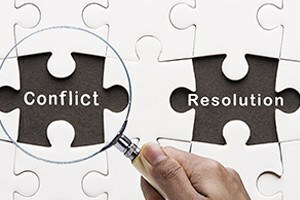 The first step in trying to resolve a disputed claim is to take it to Conciliation, which is an informal process in which the insurer, the worker, and their attorneys sit down and try to come to an agreement about the disputed benefits. If a voluntary agreement is not possible, the conciliator can refer your claim to the Industrial Accident Board, which is at the heart of the Division. There, the claim is presented at a conference before an administrative law judge. The conferences are informal proceedings at which the parties present short oral arguments and submit documents that support their positions. In certain cases, the parties' discussion can result in a settlement. However, if no settlement is possible, the judge will issue a temporary order that evaluates whether or not the insurer should pay you. Both you and the insurer have the right to appeal. Generally, the first judge to preside over the conference will also hear the case at the next stage, which is the hearing. Although the contested issues are heard without regard to what happened at the conference, the first impression you make on the judge can make a difference to your case, making it especially important to retain an attorney who can frame your case in the best possible way for the administrative judge. The hearing is the first formal proceeding in which you will participate at the Division of Dispute Resolution. The Massachusetts Rules of Evidence and DIA regulations apply to the hearing. As in a civil trial, a court stenographer will record the hearing. The administrative judge will issue a formal decision that includes rulings of law and findings of fact. You may expect to obtain workers' compensation benefits without going through the kinds of procedural complexities that are associated with civil trials. However, not all insurers make it easy. At Pulgini & Norton, our Boston workers' compensation lawyers understand how the Division of Dispute Resolution works and how to help claimants seek the benefits they need. Our firm also advises and represents people in Lowell, Newton, Andover, and other cities in Massachusetts. Call our workplace accident attorneys at 781-843-2200 or contact us via our online form for a free consultation.